Harry Ferguson an Irish farmers son was born at Growell,County Down, Ireland. The Ferguson TEA 20 name came from Tractor, England 20 horsepower. The TE range of Ferguson tractors were introduced in England in 1946 following 30 years of continuous development of "The Ferguson System" from 1916. The first work was to design a plough and linkage to integrate the tractor with its work in a manner that was an engineering whole. The automatic control system is now employed by almost all tractor manufacturers worldwide. A British patent was applied for by Harry Ferguson in 1925 and granted the following year. By the early 1930s the linkage design was finalised and is now adopted as international standard category I. 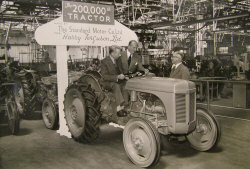 Just one prototype Ferguson System tractor, known as the Ferguson Black, was built to further technical development as well as demonstrating to potential manufactures. During 1936 the first production Ferguson tractors were built in Huddersfield, Yorkshire by the David Brown Company. This tractor, the Ferguson Model 'A' incorporated Harry Ferguson's 'suction side' hydraulic control system, the key to solving sensitive automatic control of three point mounted implements and patented on the 5th February 1936 (patent no 470069). The combination of Ferguson's converging three point hitch, patented on 3rd July 1928 (patent no 320084) with his 'suction side control' valve is the key to the success of all subsequent Ferguson and later 'Ferguson System' tractors, the most important of which is the TE and TO 20 models. (It was the production of the Model 'A' that led in 1939 to the David Brown line of tractors).In order to get volume production with lower costs Harry Ferguson, following a demonstration of his tractor before Henry Ford Senior in October 1938, concluded a gentleman's agreement with Ford to produce the Ferguson tractor in Detroit starting mid 1939. About 300,000 of these tractors, known as "Ford Ferguson" were produced up to June 30, 1947. During the War years the Ferguson design team developed many improvements to both tractor and implements and started to make arrangements to manufacture in the United Kingdom (UK). The agreement with Ford in 1938 was to include production at the Ford plant at Dagenham , Essex, in the UK but the UK Ford company would not do it. By 1945 Ferguson had made a manufacturing agreement with the Standard Motor Company of Coventry , England to produce the Ferguson tractor incorporating all their latest improvements and to be known as the TE20, ie Tractor England.Production started in the late summer of 1946, nearly a year before the last Ford Ferguson came off the line in Detroit in June 1947. The break with Ford left Harry Ferguson and his US company having implements to sell but no tractors. To make up the gap until the new Ferguson factory in Detroit started in October 1948, over 25,000 Coventry-built TE20s were shipped to the USA and Canada. The TO (Tractor Overseas) 20 was virtually the same as the TE20. Coventry production up to 1956 was 517,651 units, with about 66% being exported, mainly to Continental Europe and the British Empire but many other countries as well. To the above figure must be added TO production at Ferguson Park, Detroit. Including all 'Ferguson System' tractors from May 1936 to July 1956 brings the figure to approximately 1 million.Harry Ferguson merged his worldwide companies with Massey-Harris in July 1953, three years before TE and TO20 production ended, hence the change of name on the serial plate to 'Massey-Harris-Ferguson'. The Ferguson 35 replaced the old line in the US in 1955 and the TE20 in the UK in 1956, production here starting in September of that year following re-tooling of the factory.